Decarcerate PA has been selected to receive the Community Empowerment Award from Bread & Roses Community Fund at their Tribute to Change event. Every year, Bread & Roses honors local heroes at the Tribute to Change, an event that brings together hundreds of people in the area who are committed to social justice. The Tribute to Change will be held on Tuesday, June 24 from 5:30 to 8:00pm at the National Museum of American Jewish History at 5th and Market Streets in Philadelphia. Bread & Roses is a foundation that has funded many of Decarcerate PA’s partner organizations through their Phoebus Criminal Justice Initiative, which provides grants for organizations working against mass incarceration and its impacts. The theme for the 2014 Tribute to Change is “Conscience and Freedom,” so Bread & Roses chose to honor Decarcerate because of our work to end mass incarceration. 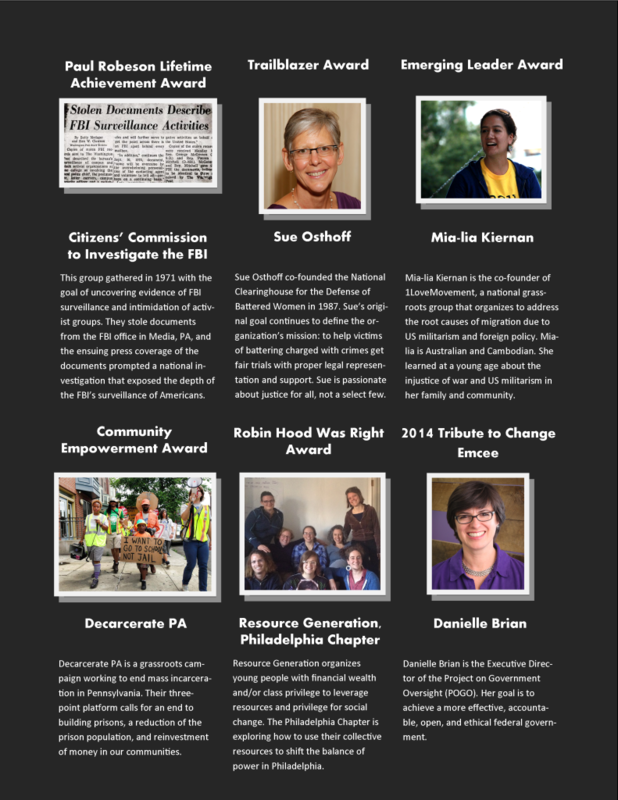 The other honorees are the Citizens’ Commission to Investigate the FBI,Sue Osthoff, Mia-lia Kiernan from the 1 Love Movement, and Resource Generation . All proceeds raised from the Tribute to Change will be used to support Bread & Roses’ programs giving grants to local grassroots organizations, expanding the training offered to community groups, and convening coalitions to build more power for real change. If you would like to request a discounted or scholarship ticket to the event, please contact Bread & Roses staff member Caitlin Quigley at 215.731.1107 ext. 202.